Bamboo Charcoal Pore Minimizing Mask, 2 oz / 55 g (Reviva Labs) - Penn Herb Co. Ltd.
Get natural exfoliation with deep natural cleansing. 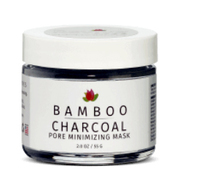 Charcoal helps to brighten dark spots, uneven skin tone, and hyperpigmentation. Gentle enough for daily or weekly use. Deionized Aqua (Water), Organic Barbadensis Leaf Juice (Aloe), Organic Helianthus Annuus (Sunflower Oil), Glyceryl Stearate, Kosher Vegetable Glycerin, Octyl Palmitate, Organic Cocos Nucifera (Coconut Oil), Kaolin, Theobroma Cacao (Cocoa Butter), Cetyl Alcohol, Potassium Stearate, Organic Beeswax, Pumice, Charcoal Powder (Bamboo Charcoal Powder), Methylsulfonylmethane (MSM), Sodium Ascorbyl Phosphate (Vitamin C), Sodium Magnesium Silicate, Magnesium Aluminum Silicate, Cellulose Gum, Purifed Smectite Clay, Citrus Limon (Lemon Essential Oil), Eucalyptus Globulous (Eucalyptus Essential Oil), Organic Syzysium Aromaticum (Clove), Eugenia Caryophyllata (Clove Essential Oil-active, not smell), Organic Juniperus Communis (Juniper), Hamamelis Virginiana (Witch Hazel), Organic Capsicum Annuum var. Aannuum (Cayenne), Organic Simmondsia Chinensis (Jojoba Oil), Calophyllum Tacamahaca (Tamanu Oil), Spirulina Maxima (Spirulina), Macrocystis Pyrifera (Kelp), Organic Borago Officinalis (Borage Oil), Organic Linum Usitatissimum (Flax Seed Oil), Organic Oenothera Biennis (Evening Primrose Oil), Organic Rosa Canina (Rose Hip Oil), Panthenol (Vitamin B5), Organic Arnica Montana (Arnica), Organic Lavandula Angustifolia (Lavender), Organic Calendula Of cinalis (Calendula), Organic Anthemis Nobilis (Chamomile), Grapeseed Oil, Macadamia Integrifolia (Macadamia Nut Oil), Sodium Carbomer, Phenoxyethanol, Ethyl Hexyl Glycerin, Organic Centella Asiatica (Gotu Kola Extract), Organic Equisetum Arvense (Horsetail Plant Extract), Organic Pelagonium Gravoleons (Geranium Extract), Organic Taraxacum Officinale (Dandelion Extract). Cruelty Free. Not tested on animals. Deep cleanse and gently exfoliate your complexion to reveal healthy-looking skin. Soothe skin and improve its tone and color while removing impurities. Apply a generous amount to face, neck and décolleté. Allow to sit for 10-20 minutes; wash off with warm water.